We are pleased to announce that the stunning classic, 80-foot, staysail schooner, Alden sailing yacht LELANTA is again available for yacht charter sailing vacations... This winter in the Caribbean and for the summer, New England. Lelanta has an aft cabin with queen bunk, bureau, drawers, hanging locker, two opening ports & companionway to the cockpit. The forward starboard cabin has two bunks (upper/lower single berths) with drawers, lockers & bulkhead hanging. This cabin has an opening port at upper bunk level & deck cowl vents. The main head is off the main salon with sink, toilet & full shower with linen cabinetry & drawer. The forward head is on the starboard side with sink, cabinetry & mirrors & toilet. 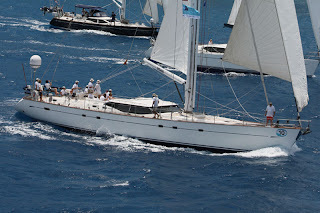 The Oyster 82 OCEANA is currently available for a New Years charter from December 26th in the British Virgin Islands. This is a lovely yacht with three crew for a maximum of six guests. Weekly rate is US$34,100 plus all expenses. There is no ten day minimum for this holiday charter. Looking for a different charter destination this season? 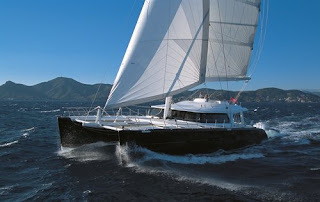 The luxurious, 74-foot Sunreef catamaran CHE, who offers maximum comfort and sophisticated style will be available for crewed yacht charters in Thailand from 5th January 2009 or in the Maldives towards the end of January 2009. The weekly rate for up to 6 guests is 35,000 euros, plus all expenses. If the brochure is asking for a password, please contact us.